Drastically simplifies app code by providing a client-side cache of observable models for RESTful resources. User Guide — Extensive! Thrilling! Full of examples! API Docs — Lascivious detail! Hidden treasure! More examples! Specs — OK, doesn’t sound glamorous, but surprisingly informative. Want your app to talk to a remote API? Welcome to your state nightmare! You need to display response data whenever it arrives. Unless the requesting screen is no longer visible. Unless some other currently visible bit of UI happens to need the same data. Or is about to need it. You should show a loading indicator (but watch out for race conditions that leave it stuck spinning forever), display user-friendly errors (but not redundantly — no modal alert dogpiles! ), give users a retry mechanism … and hide all of that when a subsequent request succeeds. Be sure to avoid redundant requests — and redundant response deserialization. Deserialization should be on a background thread, of course. Oh, and remember not to retain your ViewController / model / helper thingy by accident in your callback closures. Unless you’re supposed to. Naturally you’ll want to rewrite all of this from scratch in a slightly different ad hoc way for every project you create. Siesta ends this headache by providing a resource-centric alternative to the familiar request-centric approach. What is the latest data for this resource, if any? Did the latest request result in an error? Is there a request in progress? …and broadcasts notifications whenever the answers to these questions change. Siesta handles all the transitions and corner cases to deliver these answers wrapped up with a pretty bow on top, letting you focus on your logic and UI. …also works great from Objective-C thanks to a compatibility layer. Lightweight. Won’t achieve sentience and attempt to destroy you. It doesn’t reinvent networking. Siesta delegates network operations to your library of choice (URLSession by default, or Alamofire, or inject your own custom adapter). It doesn’t hide HTTP. On the contrary, Siesta strives to expose the full richness of HTTP while providing conveniences to simplify common usage patterns. You can devise an abstraction layer to suit your own particular needs, or work directly with Siesta’s nice APIs for requests and response entities. It doesn’t do automatic response ↔ model mapping. This means that Siesta doesn’t constrain your response models, or force you to have any at all. Add a response transformer to output models of whatever flavor you prefer, or work directly with parsed JSON. This project started as helper code we wrote out of practical need on several Bust Out Solutions projects. When we found ourselves copying the code between projects, we knew it was time to open source it. For the open source transition, we took the time to rewrite our code in Swift — and rethink it in Swift, embracing the language to make the API as clean as the concepts. Siesta’s code is therefore both old and new: battle-tested on the App Store, then reincarnated in a Swifty green field. Make the default thing the right thing most of the time. Make the right thing easy all of the time. Build from need. Don’t invent solutions in search of problems. Make client code easy to read. Make client code easy to write. …in that order of priority. Follow the Carthage instructions to add Siesta.framework to your project. If you want to use the UI helpers, you will also need to add SiestaUI.framework to your project as well. The code in Extensions/ is not part of the Siesta.framework that Carthage builds. (This currently includes only Alamofire support.) You will need to include those source files in your project manually if you want to use them. Drag Siesta.xcodeproj into your project tree as a subproject. Under your project’s Build Phases, expand Target Dependencies. Click the + button and add Siesta. Expand the Link Binary With Libraries phase. Click the + button and add Siesta. Click the + button in the top left corner to add a Copy Files build phase. Set the directory to Frameworks. Click the + button and add Siesta. If you want to use the UI helpers, you will need to repeat steps 3–5 for SiestaUI. Please let us know about it, even if you eventually figure it out. Knowing where people get stuck will help improve these instructions! Note that no actual JSON parsing occurs when we invoke jsonDict. The JSON has already been parsed off the main thread, in a GCD queue — and unlike other frameworks, it is only parsed once no matter how many observers there are. …and you have a networked UI. @IBOutlet weak var nameLabel, colorLabel: UILabel! @IBOutlet weak var statusOverlay: ResourceStatusOverlay! Note that this example is not toy code. Together with its storyboard, this small class is a fully armed and operational REST-backed user interface. Take a look at AFNetworking’s venerable UIImageView extension for asynchronously loading and caching remote images on demand. 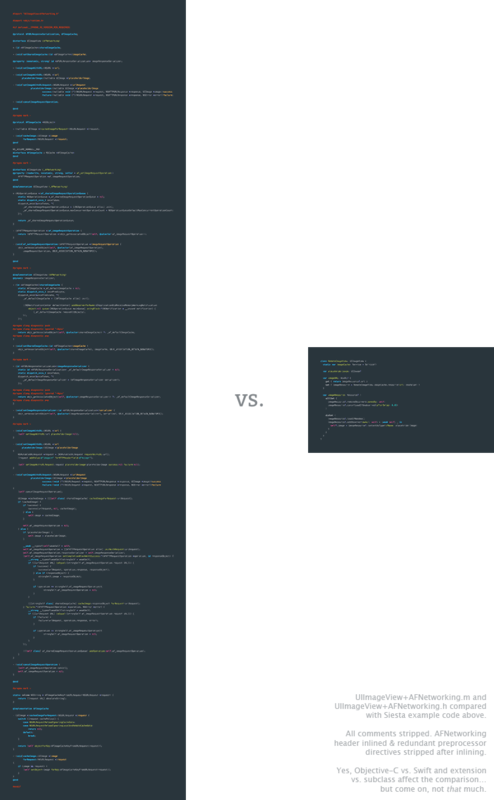 Seriously, go skim that code and digest all the cool things it does. Take a few minutes. I’ll wait. I’m a README. I’m not going anywhere. The same functionality. Yes, really. There’s a more featureful version of RemoteImageView already included with Siesta — but the UI freebies aren’t the point. “Less code” isn’t even the point. The point is that Siesta gives you an elegant abstraction that solves problems you actually have, making your code simpler and less brittle. URLSession is Apple’s standard iOS HTTP library (and is all most projects need). Siesta untangles state problems with an observable resource cache. Alamofire provides a Swifty, modern-feeling wrapper for URLSession. Moya wraps Alamofire to hide HTTP URLs and parameters. RestKit couples HTTP with JSON ↔ object model ↔ Core Data mapping. AFNetworking is a modern-feeling Obj-C wrapper for Apple’s network APIs, plus a suite of related utilities. Which one is right for your project? It depends on your needs and your tastes. Siesta has robust functionality, but does not attempt to solve everything. In particular, Moya and RestKit address complementary / alternative concerns, while Alamofire and AFNetworking provide more robust low-level HTTP support. Further complicating a comparison, some frameworks are built on top of others. When you use Moya, for example, you’re also signing up for Alamofire. Siesta uses URLSession by default, but can also stack on top of Alamofire if you want to use its SSL trust management features. Combinations abound. Nontrivial lines of code² 2500 3020 13291 965 4025 ? 1. Disclaimer: table compiled by Siesta’s non-omniscient author. Corrections / additions? Please submit a PR. 2. “Trivial” means lines containing only whitespace, comments, parens, semicolons, and braces. Despite this capabilities list, Siesta is a relatively lean codebase — smaller than Alamofire, and 5.5x lighter than RestKit. It’s not just the features. Siesta solves a different problem than other REST frameworks. Other frameworks essentially view HTTP as a form of RPC. New information arrives only in responses that are coupled to requests — the return values of asynchronous functions. Siesta puts the the “ST” back in “REST”, embracing the notion of state transfer as an architectural principle, and decoupling the act of observing state from the act of transferring it. If that approach sounds appealing, give Siesta a try. Install CocoaPods ≥ 1.0 if you haven’t already. To ask for help, please post a question on Stack Overflow and tag it with siesta-swift. (Be sure to include that tag. It triggers a notification to the Siesta core team.) This is preferable to filing an issue because other people may have the same question as you, and Stack Overflow answers are more discoverable than closed issues. Unsure which to choose? If you’re proposing a change to Siesta, use Github issues. If you’re asking a question that doesn’t change the project, and thus will remain valid even after you get an answer, then use Stack Overflow. Keep in mind that Siesta is maintained by volunteers. Please be patient if you don’t immediately get an answer to your question; we all have jobs, families, obligations, and lives beyond this project. Please be excellent to one another and follow our code of conduct.